Saachi slowly poured the kerosene over her body. The matchbox was sitting just inches away. The horror of what she was about to do didn't deter her; she deserved this. Soaked through, she reached for the matches. The time had come to say goodbye. Just a few years before, Saachi's life seemed perfect. Her husband Udit was respected as a military officer, and his generous income from the government provided more than enough to keep their two small children secure and sheltered. Saachi had a beautiful family, and all was going well. But lately, something had changed in her husband's manner, and she couldn't figure out what it was. This new routine did not thrill Saachi; money Udit once gave her in abundance had slowly decreased, until he finally stopped giving her anything at all. Saachi's previous attempts at asking had ended in painful beatings, but she had no other choice. The children were hungry, and it was Udit's duty to provide for them. She was reduced to begging from her own husband. As Saachi reminded Udit of the needs of their children, he grew irate and came at her, swinging his fists. As the blows landed, she cowered and tried to make sense of it all. Then one day he disappeared. The truth finally came out that he was having an affair, and now he had moved in with the other woman. Devastated, Saachi sunk into despair. She wept bitterly, but had no one to turn to. The children were frightened without their father, and Saachi had to figure out a way to provide for them. She found a job at a garment factory, knowing that the small income would help keep them alive. Saachi had no idea why her husband was acting differently, but the truth would soon come to light. The feelings of shelter and security were replaced by fear and hunger for Udit and Saachi's young children. Beauty isn't normally a curse, but Saachi's beauty brought her problems with the men at her new job. She was continually accosted and it left her with little dignity. Finally though, she accepted one man's advances. Their love affair was short-lived as Saachi realized this would negatively affect her family. If this new man would not accept her children, what would happen to them? Refusing to put her children at risk, she broke off the affair. As the realization hit her of what she had done, Saachi began to hate herself. She couldn't live with the knowledge of her actions, and her thoughts condemned her. Suicide was the verdict. She did not deserve to live. Saachi set down the now empty kerosene bottle. In a few moments it would all be over—the guilt, the shame, the pain. She struck the match, its small flame sizzled, and before she allowed herself to change her mind, she let it drop. As the flames enveloped her, the pain was unbearable and Saachi started to scream. The neighbors heard her cries, hurried over and rescued her. But her burns were already extensive. She was immediately taken to a hospital. 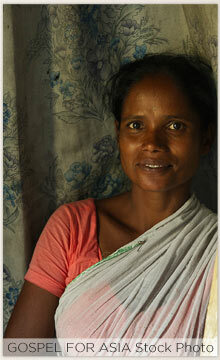 Jabeen, a Gospel for Asia-supported woman missionary, heard about Saachi and her heart ached for the poor woman. As more of the story circulated, Jabeen could understand Saachi's pain. Jabeen had grown up in a nominal Christian home. A few years after her wedding, she too learned that her husband had been involved in an affair. Like Saachi, she was devastated. 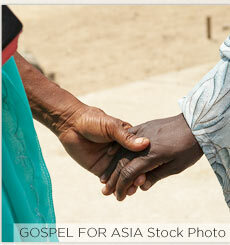 But God led her to a pastor who shared with her about the love of Jesus. She finally made her childhood faith her own and chose to follow Christ. Later, God called her to serve Him full-time, and her life had never been the same. Jabeen knew that Saachi needed to hear her testimony. Saachi's story of pain and betrayal struck a chord with a Gospel for Asia-supported woman missionary, Jabeen, who had experienced a similar tragedy in her own life. As Jabeen stood beside Saachi's hospital bed sharing her story, she told Saachi about Jesus and how precious her life was to Him. Saachi didn't need to pay for her sins; Jesus already did. Saachi wept as she realized that this man, this God, would never be unfaithful to her or abuse her. He loved her perfectly. 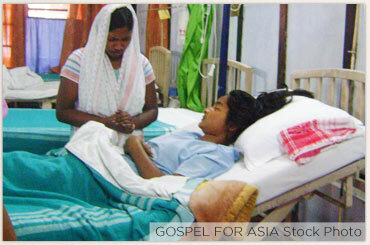 Three weeks later, Saachi was released from the hospital and decided to go to church. There, she made a decision to fully accept the love of Jesus. The scars from Saachi's burns remain, but God is healing the scars on her heart. She has found a job that helps support her and her children's needs. Her friendship with Jabeen continues, and they stay in touch. She knows that God sent Jabeen along when she needed her most. Gospel for Asia women missionaries like Jabeen can minister in ways men can't. Understanding the struggles of other women in Asia as they visit homes and hospitals, they are able to share the Gospel with those in need of hope. Please help tell these women that they are precious to God.